Wilhelm Franz Canaris (1 January 1887 – 9 April 1945) was a German admiral and chief of the Abwehr, the German military intelligence service, from 1935 to 1944. Initially a supporter of Adolf Hitler, by 1939 he had turned against the Nazis as he felt Germany would lose another major war. During World War II he was among the military officers involved in the clandestine opposition to Nazi Germany leadership. He was executed in Flossenbürg concentration camp for high treason as the Nazi regime was collapsing. Canaris was born on 1 January 1887 in Aplerbeck (now a part of Dortmund) in Westphalia, the son of Carl Canaris, a wealthy industrialist, and his wife, Auguste (née Popp). Canaris believed that his family was related to the 19th century Greek admiral, freedom fighter, and politician Constantine Kanaris, a belief that influenced his decision to join the Imperial German Navy. While on a visit to Corfu, he was given a portrait of the Greek hero that he always kept in his office. However, according to Richard Bassett, a genealogical investigation in 1938 revealed that his family was actually of Northern Italian descent, originally called Canarisi, and had lived in Germany since the 17th century. His grandfather had converted from Catholicism to Lutheranism. In 1905, at the age of seventeen, Canaris joined the Imperial Navy and by the outbreak of the First World War in 1914 was serving as an intelligence officer on board the SMS Dresden, a light cruiser he had been assigned to in December 1911. This was the only warship that managed to evade the Royal Navy for a prolonged period during the Battle of the Falkland Islands of December 1914, largely due to Canaris' skilful evasion tactics. After the Battle of Más a Tierra, the immobilized Dresden anchored in Cumberland Bay, Robinson Crusoe Island and contacted Chile with regard to internment. While in the bay, Royal Navy ships approached and shelled the Dresden. The crew scuttled the ship. Most of the crew was interned in Chile in March 1915, but in August 1915, Canaris escaped by using his fluency in Spanish. With the help of some German merchants he was able to return to Germany in October 1915. On the way, he called at several ports, including Plymouth in Great Britain. Canaris was then given intelligence work as a result of having come to the attention of German naval intelligence (likely due to his clever escape from Chile). German plans to establish intelligence operations in the Mediterranean were under way and Canaris seemed a good fit for this role. Eventually he was sent to Spain, where in Madrid his task was to provide clandestine reconnaissance over enemy shipping movements and to establish a supply service for the U-boats in naval warfare in the Mediterranean during World War I. After being assigned to the Inspectorate of Submarines by the Naval Staff on 24 October 1916, he took up training for duty as a U-boat commander and graduated from Submarine School on 11 September 1917. He ended the war as a U-boat commander from late 1917 in the Mediterranean and was credited with a number of sinkings, even coming to the attention of the Kaiser. As a result of his exploits in Spain, he was awarded the Iron Cross First Class. Canaris spoke six languages with fluency, one of which was English. As a naval officer of the old school, he had great respect for Great Britain's Royal Navy, despite the rivalry between the two nations. During the German Revolution of 1918–19, Canaris helped organise the formation of Freikorps paramilitary units in order to suppress the Communist revolutionary movements that were attempting to spread the ideals of the Russian Revolution into central European nations. He was also a member of the military court that tried (and mostly acquitted) those involved in the assassination of the leftist revolutionaries Karl Liebknecht and Rosa Luxemburg. Also during this period, he was appointed to the adjutancy of defence minister Gustav Noske. In 1919, he married Erika Waag, also the child of an industrialist, with whom he had two children. In the spring of 1924, Canaris was sent to Osaka, Japan, to supervise a secret U-boat construction program in direct violation of the Treaty of Versailles. When that project was shelved by Vice Admiral Adolf Zenker in favor of a more cooperative relationship with the British, Canaris began making deals, aided by the son of a powerful German shipping magnate, Captain Walter Lohmann — they negotiated with Spanish merchants, German industrialists, some Argentinian venture capitalists, and the Spanish navy so the Germans could continue their clandestine naval activities. Unfortunately for Canaris, he made some enemies within Germany during the course of his secret business and intelligence negotiations, partially as a consequence of the bankruptcy incurred by the film-maker Phoebus Film in his dealings with Lohmann. Suddenly, the former involvement with the "Liebknecht affair" re-emerged and placed Canaris in an unfavourable light, which ended up costing him his position in Spain. Instead, he was sent to Wilhelmshaven. From his new post, Canaris haplessly discovered that Lohmann's "investments" had cost upwards of twenty-six billion marks in total losses. At some time in 1928, Canaris was removed from his intelligence post and began two years of conventional naval service aboard the pre-Dreadnought battleship Schlesien, becoming captain of the vessel on 1 December 1932. Just two months later, Adolf Hitler became Germany's new Chancellor. Enthused by this development, Canaris was known to give lectures about the virtues of Nazism to his crew aboard the Schlesien. Detached from the previous government of Weimar whose Republican principles never appealed to Canaris, he looked to the Nazi Party to shape the future. Two things stood out for Canaris about the Nazis; one, they represented a return to state-centered authoritarian government led by a charismatic leader (which he favored) and two, the National Socialists were determined to throw off the shackles of the Versailles Treaty. Hitler proselytized a return to world-power status (which for him, implied constructing a super-fleet) through the preservation of a virtuous soldier-based society, a "community under arms." It is worth recalling that during the post-World War 1 turmoil in Germany, when the Weimar government was fledgling, Canaris helped establish home-guard units in contravention of Versailles, sympathized with the Freikorps movement, and participated in the Kapp Putsch. Another aspect of the Nazis which attracted Canaris was their views on Communism. Many of his friends joined the Nazi crusade and Canaris "likewise came to be regarded as an enthusiastic National Socialist." Former SS general Werner Best once described Canaris as an "inveterate nationalist", correspondingly asserting that he (Canaris) felt the Nazis were much better "than anything that had gone before." Even after the Röhm putsch, Canaris "preached wholehearted cooperation with the new regime." Canaris once said, "we officers...should always recognize that without the Führer and his NSDAP, the restoration of German military greatness and military strength would not have been possible...the officer's duty is to be a living example of National Socialism and make the German Wehrmacht (armed forces) reflect the fulfillment of National Socialist ideology. That must be our grand design." Taking a position as the fortress commander at Swinemünde on 29 September 1934, Canaris seemed to be near the end of his career as he settled into a sort of "provincial exile" with his family. Then in short order, Canaris caught wind of the dispute in the Reichswehr Ministry over the impending successor to the Abwehr chief Captain Conrad Patzig, who was forced to resign. Patzig recommended Canaris as his replacement due to his outstanding service record and because he considered him best suited for the position due to his previous experience in intelligence operations. His aspirations were quickly being realized and in his zeal for his new job, Canaris paid "little heed" to the warnings from Patzig about the "fiendish" machinations of the NSDAP's party and police organs. These admonitions principally concerned Reinhard Heydrich, head of the SS intelligence service known as the Sicherheitsdienst (SD), since he was not well-disposed towards the Abwehr, believing as he did that Germany's defeat during the First World War was attributable to military intelligence failures by the organization; moreover, Heydrich had aspirations to oversee all aspects of political intelligence-gathering for Germany. On 1 January 1935, a little less than two years after Hitler took total control of the German government (in 1933), Canaris was made head of the Abwehr, Germany's official military intelligence agency. Records suggest that Canaris was approved in his role as Abwehr chief as a compromise candidate since commander-in-chief of the German navy Admiral Erich Raeder (a staunch navy man) was initially opposed to his appointment but caved when Patzig manipulated the situation by suggesting an army officer for the post if Canaris was rejected. Given the seemingly amicable relationship between SD chief Heydrich and Canaris which existed at the time according to former Abwehr secretary, Inge Haag, it is possible that Heydrich supported the installment of Canaris as head of the Abwehr, at least based on their behavior toward one another. The two remained "friendly" rivals, although Canaris considered Heydrich a "brutal fanatic" and was likewise aware that Heydrich's SD constantly monitored the telephone traffic of the Abwehr. Heydrich was suspicious of Canaris and referred to him as a "wily old fox", cautioning his colleagues never to underestimate the man. Just a few weeks into his role as head of the Abwehr, he met with Heydrich and some of his officials to divide out intelligence operations between the Abwehr, Gestapo, and SD. It is clear from sources that at this point, Canaris was a true devotee to Hitler according to former Gestapo officer, Gerhard Fischer, who claimed that the Führer's gentlemanly relationship with Canaris converted the Admiral into "an extreme exponent of Hitlerism." Starting in May 1935, Canaris first donned the uniform of a rear admiral, a promotion which coincided his responsibility for shielding Germany's burgeoning rearmament program from enemy counter-intelligence agents. This meant a significant expansion of the Abwehr. Enlargement of the Abwehr mission brought Canaris into contact with "counterespionage virtuoso", Major Rudolf Bamler, who assisted him in establishing an extensive surveillance web over munitions factories, seaports, the armed forces, and the media. During the period between 1935–1937, Canaris expanded the Abwehr staff from a mere 150 people to nearly a thousand. Meeting with Heydrich again on 21 December 1936, the two men signed a document which came to be known in their orbit as the "Ten Commandments"; the agreement clarified the respective areas of counter-espionage responsibilities between the Gestapo and the Abwehr. According to biographer Heinz Höhne, Canaris subscribed to most of Hitler's views. Hitler's nationalism, his social-Darwinist beliefs, his opposition to the Versailles Treaty, his belief in rebuilding a Greater German Reich, and his anti-Semitic ideology appealed to the Abwehr chief. Prompted by anti-Semitism, Canaris first suggested the use of the Star of David to identify Jews during 1935–1936, setting them apart from German citizens within the Reich, heralding their isolation, presaging their compulsory resettlement, and ultimately leading to their physical annihilation. During the Spanish Civil War of 1936 to 1939, Germany signed an international agreement to embargo arms to the warring factions, the Nationalists of Francisco Franco and the Republicans. In fact, Germany provided aid to the fascist Franco's side, with Canaris using his contacts at England's Vickers armaments manufacturing company to help supply the Nationalists with weapons. One month before Hitler's annexation of Austria (known as the Anschluss), Canaris put the Abwehr into action, personally overseeing deception operations designed to give the Austrians the impression of what appeared to be substantial German military preparations for an impending act of aggression. Despite that the sham action did not move the Austrian Chancellor, Schuschnigg was forced to resign when German troops marched into Austria, which was followed by its official annexation into Greater Germany (Grossdeutschland) on 13 March 1938. At this development however, Canaris began spending more and more time in the company of Hans Oster and also began formulating ways to forestall or prevent a European war. Among the first to arrive in Vienna, Canaris had a special team seize records from the Austrian archives since he was worried there might be references to his Spanish Civil War arms supplier connections in London. He also absorbed as much of the Austrian intelligence service as he could into the Abwehr, while avoiding those who were Nazi converts already. Canaris was disturbed by Hitler's intention to absorb Czechoslovakia as were others, all of them fearing another European war; this resulted in the formation of a conspiratorial group consisting of members of the German Foreign Office and ranking members of the military. This assemblage included General Ludwig Beck, the Foreign Office's state secretary Ernst von Weizsäcker, General Erwin von Witzleben and Admiral Canaris. Canaris and his associates were not necessarily committed to the overthrow of Hitler's regime, but they were loosely allied to another, more radical group, the "anti-Nazi" faction led by Colonel Hans Oster and Hans Bernd Gisevius who wanted to use the crisis as an excuse for executing a putsch to overthrow the Nazi regime. The most audacious plan contemplated by Canaris, in collaboration with Ewald von Kleist-Schmenzin, was to capture and unseat Hitler and the entire Nazi Party before the invasion of Czechoslovakia. At this particular moment, Kleist visited Britain secretly and discussed the situation with British MI6 and some high-ranking politicians. There, the name of Canaris became widely known as Kleist's executive hand in the event of an anti-Nazi plot. The high-ranking German military leaders believed that if Hitler invaded Czechoslovakia, or any other country, Britain would declare war on Germany. MI6 was of the same opinion. The British declaration of war would have given the General Staff, in their belief, both the pretext and support for an overthrow of Hitler, which many of them were planning given the prevailing "anti-war sentiment of the German people." The reaction of the British government to Hitler's demands on the Sudetenland was more cautious. At a meeting with Hitler in Munich, British Prime Minister Neville Chamberlain and French Prime Minister Édouard Daladier chose diplomacy over war. The Munich Agreement was thus a severe disappointment for Kleist and Canaris. It gave Hitler's reputation an important boost and his popularity soared, as he appeared to have brought peace. However, Hitler was scornful of his generals for resisting his plans, since he had wanted war. Hermann Göring fell out of favor with him for negotiating peace, yet Hitler's drive for war remained unabated despite the Western powers having granted him concessions. Canaris was relieved that war was averted and sought to re-establish contact with Hitler since many of the Abwehr reports submitted on the Sudeten crisis had proven grossly inaccurate. To Oster and his circle, Canaris suddenly appeared recommitted to Hitler. In January 1939, Canaris manufactured the "Dutch War Scare" that gripped the British government. By 23 January 1939, the British government received information that Germany intended to invade the Netherlands in February 1939 with the aim of using Dutch airfields to launch a strategic bombing offensive intended to achieve a "knock-out" blow against Britain by razing British cities to the ground. All this information was false, and it was intended by Canaris to achieve a change in British foreign policy. In this, Canaris was successful, and the "Dutch War Scare" played a major role in causing Chamberlain to make the "continental commitment" by sending a large British ground force to the defence of France in February 1939. Over the course of the war, the Twenty Committee grew to about 120 double-agents. However, in 1941, the Twenty Committee almost abandoned its double-agents when it found that Owens was also double-crossing MI5. However, when the Abwehr failed to take any demonstrable countermeasures, the Twenty Committee chose instead to provide its double-agents with disinformation to pass on to Germany. After the war, it was discovered that Ritter had known that the cover for the agents in Britain had been compromised, but due to the fear of repercussions, he did not inform Canaris. In 1937, Canaris created a new office of air intelligence in the Abwehr and assigned Hauptmann Nikolaus Ritter of the Luftwaffe to be the chief of I. Luft (Chief of Air Intelligence). Ritter, who had lived in the United States for 12 years, was given primary authority over Abwehr agents operating in the Americas and Great Britain. Canaris instructed Ritter to contact a former spymaster he knew from the First World War who was living in New York, Fritz Joubert Duquesne. Back in 1931, Ritter had met Duquesne in New York, and the two spies reconnected in New York on 3 December 1937. Ritter also met with Herman W. Lang, a spy who operated under the code name: PAUL. Herman Lang worked as a machinist, draftsman, and assembly inspector for the Carl L. Norden Company in New York where he had been contracted to manufacture an advanced, top secret military bomber part, the Norden bomb-sight. He provided the Abwehr a large drawing of the bomb-sight and later went to Germany to work on and finish an improved version. While in Germany, Lang met with Canaris and Hermann Göring. Ritter employed several other successful agents across the U.S., but he also made the mistake of recruiting a man who would later become a double agent for the Federal Bureau of Investigation (FBI), William Sebold. On 8 February 1940, Ritter sent Sebold to New York under the alias of Harry Sawyer and instructed him to set up a shortwave radio-transmitting station to establish contact with the German shortwave station abroad. Sebold was also instructed to use the code name TRAMP and to contact a fellow agent code named DUNN, Fritz Duquesne. On 28 June 1941, following a two-year investigation, the FBI arrested Col. Duquesne and 32 Nazi spies on charges of relaying secret information on U.S. weaponry and shipping movements to Germany. On 2 January 1942, less than a month after the U.S. was attacked by Japan at Pearl Harbor and Germany declared war on the United States, the 33 members of the Duquesne Spy Ring were sentenced to serve a total of more than 300 years in prison. They were found guilty in what historian Peter Duffy said in 2014 is "still to this day the largest espionage case in the history of the United States". One German spymaster later commented that the ring's roundup delivered 'the death blow' to their espionage efforts in the United States. J. Edgar Hoover called his FBI swoop on Duquesne's ring the greatest spy roundup in U.S. history. In a 1942 memo to his superiors, Canaris reported on the importance of several of his captured spies by noting their valued contributions, and he writes that Duquesne "delivered valuable reports and important technical material in the original, including U.S. gas masks, radio-controlled apparatus, leak proof fuel tanks, television instruments, small bombs for airplanes versus airplanes, air separator, and propeller-driving mechanisms. Items delivered were labeled 'valuable', and several 'good' and 'very good'". After the outbreak of war between Germany and Poland in September 1939, Canaris visited the front, where he saw the devastation rendered by the German military—seeing Warsaw in flames nearly brought him to tears and it was reported that he exclaimed, "our children's children will have to bear the blame for this". He also witnessed examples of the war crimes committed by the Einsatzgruppen of the SS, including the burning of the synagogue in Będzin with 200 Polish Jews inside. Moreover, he received reports from Abwehr agents about several incidents of mass murder throughout Poland. Canaris visited Hitler's headquarters train on 12 September 1939, at the time in Province of Silesia, to register his objection to the atrocities. Canaris told chief of the Oberkommando der Wehrmacht (OKW, Supreme Command of the Armed Forces) Wilhelm Keitel about the "extensive shootings ... and that the nobility and clergy were to be exterminated" to which Keitel informed him that Hitler had already "decided" the matter. Keitel warned Canaris to go no further with his protest, as the detailed plan of atrocities came directly from Hitler. Canaris began working more actively to overthrow Hitler's régime, although he also cooperated with the SD to create a decoy. This made it possible for him to pose as a trusted man for some time. He was promoted to the rank of full Admiral in January 1940. With his subordinate Erwin Lahousen, he attempted in the autumn of 1940 to form a circle of like-minded Wehrmacht officers. At the time, this had little success. When the OKW decrees regarding the brutal treatment of Soviet prisoners of war related to the Commissar Order came to the attention of Canaris in mid-September 1941, he registered another complaint. Keitel reminded Canaris that he was thinking in terms of "chivalrous war", which did not apply, as this was "a matter of destroying a world ideology". Meanwhile, the complaints and Canaris' apparent squeamishness were noted by Heydrich and added to his file on the "political unreliability" of the Abwehr. Canaris also worked to thwart the proposed Operation Felix, the German plan to seize Gibraltar. At a conference of senior officers in Berlin, in December 1941, Canaris is quoted as saying "the Abwehr has nothing to do with the persecution of Jews. ... no concern of ours, we hold ourselves aloof from it". It has been speculated that Canaris was in contact with British intelligence during this time, despite the war between the two countries. It is thought that during Operation Barbarossa, the invasion of the Soviet Union, he received a detailed report of all the enemy positions that was known only to the British. The head of MI6, Stewart Menzies, who shared Canaris' views opposing Communism, praised Canaris' courage and bravery at the end of the war. In December 1940, Hitler sent Canaris to Spain to conclude an agreement (through strong coercion if necessary) with Franco for Spanish support in the war against the Allies, but instead of prompting the Spaniard to acquiesce to Hitler's desire, Canaris reported that Franco would not commit Spanish forces until Great Britain was defeated. Conversations from this period between Franco and Admiral Canaris remain a mystery since none were recorded, but the Spanish government later expressed gratitude to the widow of Canaris at the conclusion of the Second World War by paying her a pension. In June 1942, Canaris sent eight Abwehr agents to the East Coast of the United States as part of Operation Pastorius. The mission was to sabotage American economic targets and demoralise the civilian population inside the United States. However, two weeks later, all were arrested by the FBI thanks to two Abwehr agents who betrayed the mission. Because the Abwehr agents were arrested in civilian clothes, they were subject to court martial by a military tribunal in Washington, D.C. All were found guilty and sentenced to death. Two others who cooperated with the FBI received sentences of life imprisonment instead. The others were executed by the electric chair in the District of Columbia jail. Due to the embarrassing failure of Operation Pastorius, no further sabotage attempt was ever made in the United States. After 1942, Canaris visited Spain frequently and was probably in contact with British agents from Gibraltar. In 1943, while in occupied France, Canaris is said to have made contact with British agents. He was conducted blindfolded to the Convent of the Nuns of the Passion of our Blessed Lord, 127 Rue de la Santé, where he met the local head of the British Intelligence Services, code name "Jade Amicol", in reality Colonel Claude Olivier. Canaris wanted to know the terms for peace if Germany got rid of Hitler. Churchill's reply, sent to him two weeks later, was simple: "Unconditional surrender". During Heydrich's posting in Prague, a serious incident put him and Canaris in open conflict. Heydrich requested that Canaris put the Abwehr under SD and SS control. Canaris appeared to retreat and handled the situation diplomatically, but there was no immediate effect on the Abwehr for the time being. In fact, Canaris had established another two links with MI6—one via Zürich, and the other via Spain and Gibraltar. It is also possible that Vatican contacts provided a third route to his British counterparts. Canaris also intervened to save a number of victims from Nazi persecution, including Jews, by getting them out of harm's way; he was instrumental, for example, in getting five hundred Dutch Jews to safety in May 1941. Many such people were given token training as Abwehr "agents" and then issued papers allowing them to leave Germany. One notable person he is said to have assisted was the then Lubavitcher Rebbe in Warsaw, Rabbi Yosef Yitzchok Schneersohn. This has led Chabad Lubavitch to campaign for his recognition as a Righteous Gentile by the Yad Vashem Holocaust memorial. The evidence that Canaris was playing a double game grew and, at the insistence of Heinrich Himmler, Hitler dismissed Canaris and abolished the Abwehr in February 1944. The functions of the Abwehr were taken over by the Ausland-SD, part of the Reich Main Security Office (RSHA) and led by SS-Brigadeführer Walter Schellenberg. Previous areas once the responsibility of the Abwehr were divided between Gestapo chief Heinrich Müller and Schellenberg. Some weeks later, Canaris was put under house arrest. He was released from house arrest in June 1944 to take up a post in Berlin as the head of the Special Staff for Mercantile Warfare and Economic Combat Measures (HWK). The HWK coordinated resistance to the allied economic blockade of Germany. Canaris was arrested on 23 July 1944 on the basis of the interrogation of his successor at Military Intelligence, Georg Hansen. Schellenberg respected Canaris and was convinced of his loyalty to the Nazi regime, even though he had been arrested. Hansen admitted his role in the 20 July plot but accused Canaris of being its "spiritual instigator". No direct evidence of his involvement in the plot was discovered, but his close association with many of the plotters and certain documents written by him that were considered subversive led to the gradual assumption of his guilt. Two of the men under suspicion as conspirators who were known in Canaris' circle shot themselves which incited activity from the Gestapo to prove he was, at the very least, privy to the plan against Hitler. Investigations dragged on inconclusively until April 1945, when orders were received to dispose of various remaining prisoners in the 20 July plot. Canaris' personal diary was discovered and presented to Hitler in early April 1945, implicating him in the conspiracy. Canaris was placed on trial by an SS summary court presided over by Otto Thorbeck with Walter Huppenkothen as prosecutor. He was charged with and found guilty of treason. He was sentenced to death. Together with his deputy General Hans Oster, military jurist General Karl Sack, theologian Rev. Dietrich Bonhoeffer and Ludwig Gehre, Canaris was humiliated before witnesses. Canaris was led to the gallows naked and executed on 9 April 1945 at the Flossenbürg concentration camp, just weeks before the end of the war. A prisoner claimed he heard Canaris tap out a coded message on the wall of his cell on the night before his execution, in which he denied he was a traitor and said he acted out of duty to his country. Accompanying Canaris in death on that April day at Flossenbürg (to the background noise of Allied guns making their approach) were Hans Oster and the theologian Bonhoeffer. Erwin von Lahousen and Hans Bernd Gisevius, two of Canaris' main subordinates, survived the war and testified during the Nuremberg trials about Canaris' courage in opposing Hitler. Lahousen recalled a conversation between Canaris and General Wilhelm Keitel in which Canaris warned Keitel that the German military would be held responsible for the atrocities in Poland. Keitel responded that they had been ordered by Hitler. Keitel, who survived the war, was found guilty of war crimes at Nuremberg and hanged. The 1954 film Canaris starring O. E. Hasse is based on his biography. In the 1964 Czechoslovak movie Atentát (The Assassination), directed by Jiří Sequens, Canaris is portrayed by German actor Harry Studt. In the 1976 film The Eagle Has Landed, Canaris was played by actor Anthony Quayle. ^ a b Höhne 1979, p. 4. ^ Bassett 2011, pp. 63–65. ^ Höhne 1979, p. 17. ^ Kahn 1978, p. 227. ^ Höhne 1979, pp. 31–35. ^ Bassett 2011, p. 43. ^ Höhne 1979, p. 36. ^ Bassett 2011, p. 49. ^ Höhne 1979, pp. 37–38. ^ Höhne 1979, pp. 44–45. ^ Bassett 2011, p. 59. ^ Bassett 2011, pp. 35, 38, 40, 42, 67–68. ^ Höhne 1979, p. 16. ^ Höhne 1979, pp. 56–87. ^ Höhne 1979, pp. 58–59. ^ a b LeMO (July 2016). Wilhelm Canaris. ^ Bassett 2011, p. 83. ^ Bassett 2011, pp. 83–88. ^ a b Bassett 2011, p. 89. ^ Evans 2006, p. 11. ^ Kahn 1978, p. 229. ^ Höhne 1979, pp. 130–131. ^ a b Wistrich 1995, p. 29. ^ Höhne 1979, pp. 131–132. ^ Höhne 1979, p. 132. ^ Höhne 1979, p. 134. ^ Höhne 1979, pp. 135–136. ^ Kahn 1978, pp. 228–229. ^ Höhne 1979, p. 136. ^ Gerwarth 2012, pp. 84–85. ^ Zentner & Bedürftig 1991, p. 125. ^ Bassett 2011, pp. 97–98. ^ Bassett 2011, p. 98. ^ Bassett 2011, p. 99. ^ Kahn 1978, p. 231. ^ Höhne 1979, p. 213. ^ Höhne 1979, pp. 186–187. ^ Höhne 1979, p. 187. ^ Bassett 2011, p. 114. ^ Kahn 1978, pp. 231–232. ^ Höhne 1979, p. 215. ^ Höhne 1979, p. 216. ^ Höhne 1979, pp. 216–217. ^ Bassett 2011, p. 82. ^ a b Bassett 2011, p. 149. ^ Kahn 1978, p. 234. ^ Evans 2006, pp. 646–653. ^ Bassett 2011, p. 148. ^ Hildebrand 1973, pp. 70–71. ^ Müller 1985, pp. 162–163, 166–167. ^ Hoffmann 1977, pp. 60–63. ^ Evans 2006, pp. 668–670. ^ Bassett 2011, p. 159. ^ Waller 1996, pp. 56–58. ^ Bassett 2011, pp. 160–162. ^ Kershaw 2001, pp. 123–126. ^ Höhne 1979, pp. 311–312. ^ Watt 1989, p. 101. ^ Watt 1989, pp. 103–104. ^ Watt 1989, pp. 102–103. ^ a b c d Roberts & West 2011. ^ a b c d Fischer 2000. ^ Duffy 2014, p. 13. ^ Duffy 2014, pp. 13–15. ^ a b c d Evans 2014. ^ Duffy 2014, p. 26. ^ Duffy 2014, pp. 44–45. ^ Lee 1951, p. 132. ^ a b c FBI 2016. ^ Duffy 2014, p. 2. ^ Duffy 2014, p. 224. ^ Höhne 1979, p. 361. ^ Stewart 2009, p. 58. ^ Höhne 1979, pp. 363–365. ^ Höhne 1979, p. 364. ^ Kershaw 2008, p. 520. ^ a b Gilbert 2004, p. 8. ^ Kershaw 2008, p. 542. ^ Jacobsen 1968, p. 526. ^ Bassett 2011, p. 224. ^ Breitman et al. 2005, p. 99. ^ Rich 1973, pp. 173–174. ^ Rich 1973, p. 174. ^ MacDonnell 1995, pp. 131–133. ^ Johnson 2007, p. 204. ^ MacDonnell 1995, p. 133. ^ Lindgren 1970, pp. 279–81. ^ Bassett 2011, pp. 226–231. ^ Bassett 2011, pp. 231–36. ^ Höhne 1979, p. 489. ^ Altein 2002, p. 160. ^ Wagner, The Jerusalem Post (04 August 2009). ^ Höhne 2001, p. 486. ^ Höhne 1979, pp. 553–54. ^ Wheeler-Bennett 1980, p. 596. ^ Höhne 1979, p. 556. ^ Höhne 1979, p. 561. ^ Höhne 1979, pp. 559–570. ^ Höhne 2001, pp. 486–487. ^ a b Höhne 1979, p. 570. ^ Bassett 2011, pp. 288–289. ^ Bassett 2011, p. 289. ^ Shirer 1990, p. 1073. ^ Abshagen 1956, pp. 252–255. ^ Wistrich 1995, p. 137. Abshagen, Karl Heinz (1956). Canaris. London: Hutchinson. ASIN B001CD7LTW. Altein, Rachel (2002). Eliezer Y. Zaklikovsky (ed.). Out of the Inferno: The Efforts That Led to the Rescue of Rabbi Yosef Schneersohn of Lubavitch from War-Torn Europe in 1939–40. New York: Kehot. ISBN 978-0-82660-683-9. Bassett, Richard (2011). Hitler's Spy Chief: The Wilhelm Canaris Betrayal. New York: Pegasus Books. ISBN 978-1-60598-450-6. Breitman, Richard; Goda, Norman J.W. ; Naftali, Timothy; Wolfe, Robert (2005). U.S. Intelligence and the Nazis. Cambridge and New York: Cambridge University Press. ISBN 978-0-52161-794-9. Duffy, Peter (2014). Double Agent. New York: Scribner. ISBN 978-1-4516-6795-0. "Duquesne Spy Ring - FBI". Federal Bureau of Investigation. Retrieved 29 September 2016. Evans, Leslie (1 April 2014). "Fritz Joubert Duquesne: Boer Avenger, German Spy, Munchausen Fantasist". Retrieved 19 September 2016. Evans, Richard (2006). The Third Reich in Power. New York: Penguin. ISBN 978-0-14303-790-3. Gerwarth, Robert (2012). Hitler's Hangman: The Life of Heydrich. New Haven, CT: Yale University Press. ISBN 978-0-30018-772-4. Gilbert, Martin (2004). The Second World War: A Complete History. New York: Henry Holt. ISBN 978-0-80507-623-3. Hildebrand, Klaus (1973). The Foreign Policy of the Third Reich. Berkeley and Los Angeles: University of California Press. ISBN 0-520-02528-8. Hoffmann, Peter (1977). The History of the German Resistance, 1933–1945. Cambridge, MA: MIT Press. ISBN 978-0-26208-088-0. Höhne, Heinz (1979). Canaris: Hitler’s Master Spy. New York: Doubleday. ISBN 0-385-08777-2. Höhne, Heinz (2001). The Order of the Death’s Head: The Story of Hitler’s SS. New York: Penguin Press. ISBN 978-0-14139-012-3. Jacobsen, Hans-Adolf (1968). "The Kommissarbefehl and Mass Executions of Soviet Russian Prisoners of War". In Krausnick, Helmut; Buchheim, Hans; Broszat, Martin; Jacobsen, Hans-Adolf (eds.). Anatomy of the SS State. New York: Walker and Company. ISBN 978-0-00211-026-6. "Jewish Virtual Library". Wilhelm Canaris. Retrieved 17 December 2018. Johnson, David Alan (2007). Betrayal: The True Story of J. Edgar Hoover and the Nazi Saboteurs Captured During WWII. New York: Hippocrene Books. ISBN 978-0-78181-173-6. Kahn, David (1978). Hitler’s Spies: German Intelligence in World War II. New York: MacMillan. ISBN 0-02-560610-7. "Lebendiges Museum Online–LeMO". Wilhelm Canaris. Retrieved July 21, 2016. Lee, Henry (1951). "Biggest Spy Ring". Coronet. 31 (2). Lindgren, Henrik (1970). "Adam von Trotts Reisen nach Schweden 1942–1944. Ein Beitrag zur Frage der Auslandsverbindungen des deutschen Widerstandes" [Adam von Trott’s Travels to Sweden 1942–1944. A Contribution to the Question of Foreign Connections to the German Resistance]. Vierteljahrshefte für Zeitgeschichte (in German). Munich: Oldenbourg Wissenschaftsverlag GmbH. 18 (3): 274–291. JSTOR 30197746. MacDonnell, Francis (1995). Insidious Foes: The Axis Fifth Column and the American Home Front. Oxford and New York: Oxford University Press. ISBN 978-0-19509-268-4. "Obituary. Fritz Joubert Duquesne". Time Magazine. 24 June 1956. ISSN 0040-781X. Rich, Norman (1973). Hitler’s War Aims: Ideology, the Nazi State, and the Course of Expansion. New York: W. W. Norton & Company. ISBN 0-393-05454-3. Roberts, Madoc; West, Nigel (2011). Snow: the Double Life of a World War II Spy. London: Biteback. ISBN 9781849540933. OCLC 751861321. Stewart, William (2009). Admirals of the World: A Biographical Dictionary, 1500 to the Present. Jefferson, NC and London: McFarland & Company. ISBN 978-0-78643-809-9. Wagner, Matthew (2009). "Chabad: Make Nazi Commander a Righteous Gentile". The Jerusalem Post. Retrieved July 22, 2016. Waller, John (1996). The Unseen War in Europe: Espionage and Conspiracy in the Second World War. New York: Random House. ISBN 978-0-67944-826-6. Watt, Donald Cameron (1989). How War Came: Immediate Origins of the Second World War, 1938–1939. New York: Pantheon. ISBN 978-0-67973-093-4. Wheeler-Bennett, John W. (1980). Nemesis of Power: The German Army in Politics 1918–1945. Basingstoke: Palgrave Macmillan. ISBN 0-333-06864-5. Wistrich, Robert (1995). Who's Who In Nazi Germany. New York: Routledge. ISBN 978-0-41511-888-0. Brown, Anthony Cave. C: The Secret Life of Sir Stewart Graham Menzies, Spymaster to Winston Churchill, 1987, Macmillan Publishing, New York, ISBN 0-02-517390-1. Knopp, Guido, Hitlers Krieger, 2000, Goldman Verlag, ISBN 3-442-15045-0. Hastings, Max. The Secret War: Spies, Ciphers, and Guerrillas, 1939–1945. New York: Harper, 2016. Müller, Klaus-Jürgen. "The German Military Opposition before the Second World War" pages 61–75 from The Fascist Challenge and the Policy of Appeasement edited by Wolfgang Mommsen & Lothar Lettenacke, George Allen & Unwin: London, United Kingdom, 1983, ISBN 0-04-940068-1. Paine, Lauran (1984). The Abwehr: German Military Intelligence in World War Two. Xs Books. ISBN 0-7091-9628-8. Waller, John H. "The double life of Admiral Canaris." International Journal of Intelligence and Counter Intelligence (1996) 9#3 pp: 271-289. Wikimedia Commons has media related to Wilhelm Canaris. Helgason, Guðmundur. 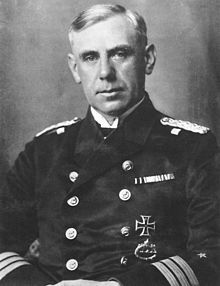 "WWI U-boat commanders: Wilhelm Canaris". German and Austrian U-boats of World War I - Kaiserliche Marine - Uboat.net. Retrieved 18 August 2016.